The Insurance Institute for Business & Home Safety (IBHS) developed this Manufactured Home Inspection Checklist to help residents gauge how vulnerable their manufactured home might be to wind damage, based on where it’s located, how well it’s anchored, and what type of foundation was used. The Institute also has a very informative site called DisasterSafety.org where you can type in your zip code and identify the risks that you face in your area. If your home was built before June 1976, then there were no universal standards in place and your home is likely quite vulnerable to damage in a severe windstorm or hurricane. Between June 1976 and July 1994 manufactured housing was built to a single HUD standard regardless of where it was to be sited. While these homes (especially the double-wide units) typically perform better in high wind events than the pre-1976 homes, they are not nearly as wind resistant as the HUD Wind Zone II and Wind Zone III homes built after July 1994. Since July 1994, each newly constructed manufactured home has been required to comply with the Manufactured Home Construction and Safety Standards, commonly called the HUD Code. The HUD Code stipulates the home shall be designed and constructed to conform to one of three wind load zones. The appropriate wind zone used in the design is dependent upon where the home will be initially installed. 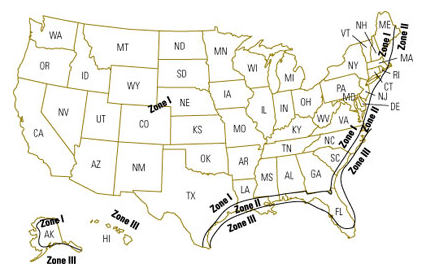 Homes designed and constructed to HUD Wind Zone I cannot be installed in a higher wind zone. If you are purchasing a new manufactured home, have it installed on a permanent foundation. If a permanent foundation is not feasible, the latest anchorage recommendations for HUD Wind Zone III should be used for maximum resistance against uplift and overturning forces. If you own one of the older homes or a HUD Wind Zone I home, the structure of the home is vulnerable to damage in a severe wind event and strengthening of that structure is difficult to accomplish. The following checklist may help you better assess the level of vulnerability that exists and the actions listed below may help to reduce the overall vulnerability of the home and will hopefully improve the chances that the home will still be there when you return after the event. The following is a list of items to inspect with regards to site characteristics, foundation requirements, and anchoring requirements for an existing manufactured home. Are there trees that are in close proximity or hang over the home that can potentially cause damage during a high wind event? Trees that are in close proximity or hang over the home can fall or branches can break off the tree during a high wind event. Trees should be pruned to reduce the risk of damage or possibly removed to eliminate the danger of tree fall. Of particular concern are pine trees, 12-inches or more in diameter, that are tall enough to fall across the home. Are there power lines directly over or near the home that can pose a threat to the home during a high wind event? Power lines are located in a public right of way; therefore if a manufactured home is installed under a power line, it was likely sited in the incorrect location. During a high wind event, power lines may be pushed laterally, causing slack in the power line, knocked down by debris or failed poles and towers. You may be in danger if the power line comes in contact with the home. Is there a gas tank outside of the home that is not properly tied down to a concrete foundation? If there is a gas tank outside the home, it should be supported by a concrete foundation with anchor bolts embedded into the foundation at all four legs. Anchor bolts should not be severely rusted or corroded. Is your home located in a park with older homes or homes with additions, roof replacements and carports? Pre-HUD standard homes (typically single wide homes built before 1976) are very vulnerable to damage, and destruction in severe windstorms. Manufactured homes built between 1976 and 1994 or post-1994 wind zone I homes are also vulnerable to damage and destruction in severe windstorms. Carports and additions frequently fail in severe winds as do roof structures added over top of the original roof on older homes. Failures of these structures can generate a tremendous amount of windborne debris that can damage your home. 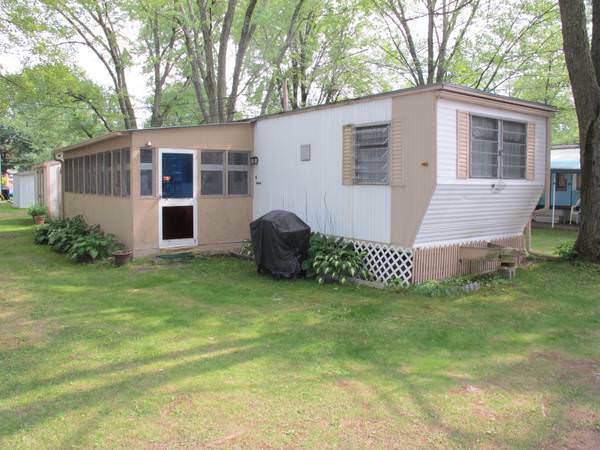 Additions on both sides of this mobile home. Does your home have one or more extra rooms, a carport, and/or a storage room that has been added by someone other than the original manufacturer? Carports and additions are designed to lower wind load standards than the newer high wind rated homes. The manufactured housing industry generally requires that additions be freestanding (not attached to the manufactured home) unless it is sold as a kit designed for that home. It is not uncommon, however, for engineers to certify that the home is capable of supporting an attached carport or addition. This paves the way for aftermarket carports and additions, many of which are designed to lower standards. IBHS recommends that you have any carport, porch or addition checked to evaluate its strength and anchorage. A starting point would be to contact the manufacturer of your home and see if they can recommend someone in the area who in familiar with proper wind resistant construction details for your type of addition or carport. Improving the anchorage of the addition or carport, improving the lateral bracing of the structure, adding more fasteners to the roof panels and possibly replacing or adding more support members are typical ways of reinforcing an existing carport of addition. If you want to add a carport or addition, IBHS recommends that you purchase one with the highest wind rating (design wind speed) you can afford and that it is freestanding or attached in a manner that is appropriate for the home you own. The addition could use some updating. Are there loose or missing exterior trim or panels? Loose trim and paneling at the exterior surface of the home can become a source of windborne debris during a high wind event. Additionally, if exterior trim or paneling is missing, the building envelope is not fully protected from water damage inside the home. Are there loose or missing flashing around the perimeter exterior wall openings and/or roof edges? Flashing is a thin impervious material consisting of sheet metal, plastic, rubber, etc. that can be found at intersections and terminations of roofing systems and other exterior surfaces. 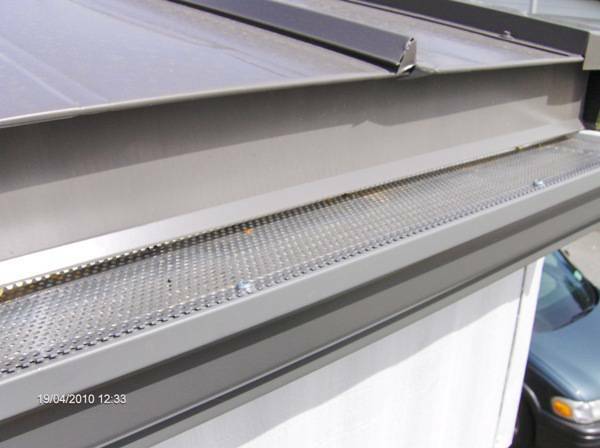 It is used to prevent water from penetrating the building envelope (roof and walls). Flashing is most commonly found at roof valleys, chimneys, roof penetrations, eaves, skylights roof-to-wall intersections, and around exterior wall penetrations such as windows and doors. Loose or missing flashing allows water to penetrate the building envelope and can potentially cause water damage to the structure and interior finishes. Additionally, loose flashing can become a source of windborne debris during a high wind event. Estimates suggest that more than 95 percent of manufactured housing units are never moved from their initial site. Consequently, it is prudent to install the home using the most permanent foundation system that you can afford. A permanent concrete foundation or reinforced concrete masonry stem wall on a poured footing will minimize the movement of the home in a high wind event. Shallow earth screws, that are commonly used to anchor manufactured housing units, have frequently exhibited significant lateral movement (4 to 12 inches or more) before the design capacity is developed if it is in fact ever developed. 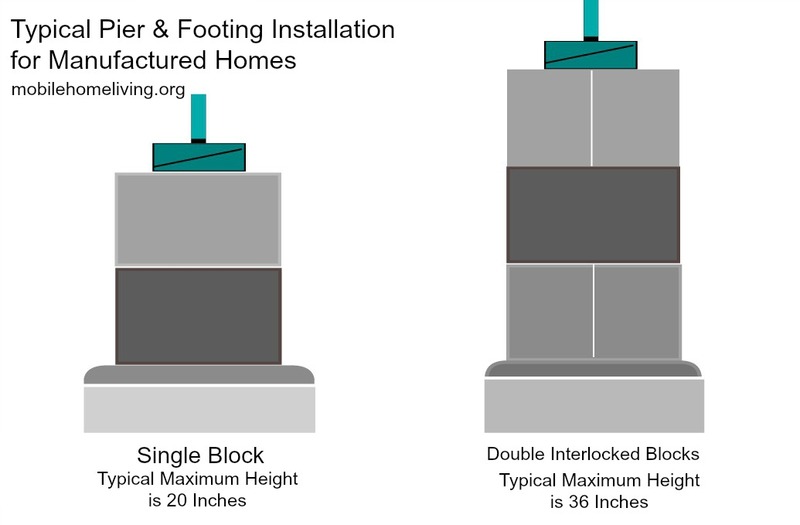 IBHS recommends that you install your home on a permanent reinforced concrete or reinforced masonry foundation. If that is not possible, consider pouring a concrete slab under the home that encompasses the heads of the anchors or at least a concrete perimeter footer that encompasses the heads of the anchors. For an existing installation, access underneath the manufactured home is required to properly inspect the manufactured home’s foundation and support structure. A flashlight, gloves, knee pads, jumpsuit, moth crystals, and a snake and/or rodent-repelling substance are useful recommended equipment to have before inspecting underneath any home. Additionally, inspectors should know what Brown Recluse and Black Widow spiders look like since it is possible to encounter these spiders during an inspection. 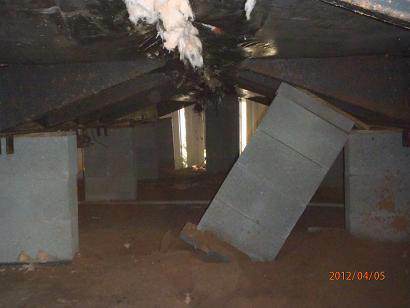 Bent or rusted I-beams indicate that the weight of the manufactured home may not be properly supported. If the I-beams show signs of serious deflection, the masonry piers supporting the home may not be properly spaced to support the home on the soil conditions present at the site. Sticking doors and windows and valleys or humps in the floor are also signs within the home that an I-beam may be severely bent. A damaged floor framing system is a sign of possible structural failure. Since the wood floor framing is covered by a floor covering on the top and a moisture barrier underneath the home, it may be difficult to inspect. Potential damage may show up as soft spots on the floor. If you are concerned that your wood floor framing may be damaged or rotted, contact the manufacturer of your home and ask for a recommendation of someone to conduct an inspection of your floor system. A rotted floor framing system indicates moisture intrusion into the home. Check plumbing and water using devices like toilets, hot water heaters and washing machines to ensure they are not leaking. Have the rotted framing members replaced and make sure that measures (caulking, moisture barriers, etc.) are taken to prevent future moisture intrusion. Large cracks, chips, or damage to the masonry piers may reduce the structural support of the manufactured home. 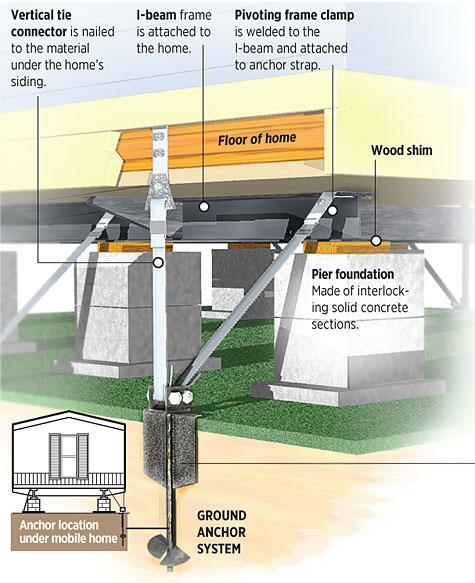 If several of the home’s piers are severely damaged, it is recommended that you have a certified installer evaluate the integrity of the foundation pier system. 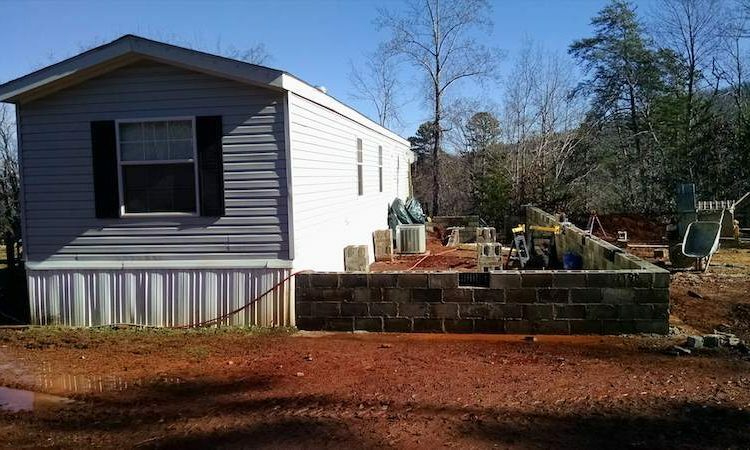 Masonry piers are used to support the weight of the manufactured home. Those piers that are not in contact with the frame are not contributing to the support of the home and can cause excessive deflection in the beams, which can ultimately lead to structural damage. Contact a certified installer to correct any loose or non-supporting piers. Masonry block is designed to support more weight if the holes are facing in an upward direction. Additionally, if holes are facing sideways, they provide a potential home for snakes and rodents. Is the cap on the masonry piers wood or concrete? 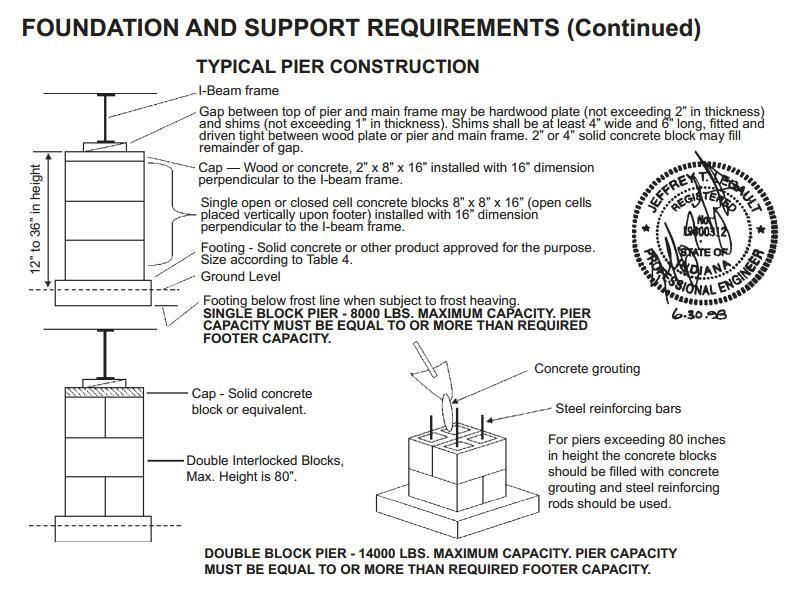 Concrete caps can support more weight than a wood cap and are not subject to rot and termite infestation and are therefore the IBHS recommended cap for a masonry pier. Is the cap on the masonry piers cracked, rotted, or otherwise damaged? If the cap on the masonry pier is cracked, rotted or otherwise damaged, it cannot effectively support the intended weight it was designed to support. Cracked, rotted or damaged pier caps should be replaced. Contact a certified installer to replace any cracked rotted or damaged pier caps. Wooden wedges are often used to fi ll a gap that may exist between the pier cap and the structural I-beam. 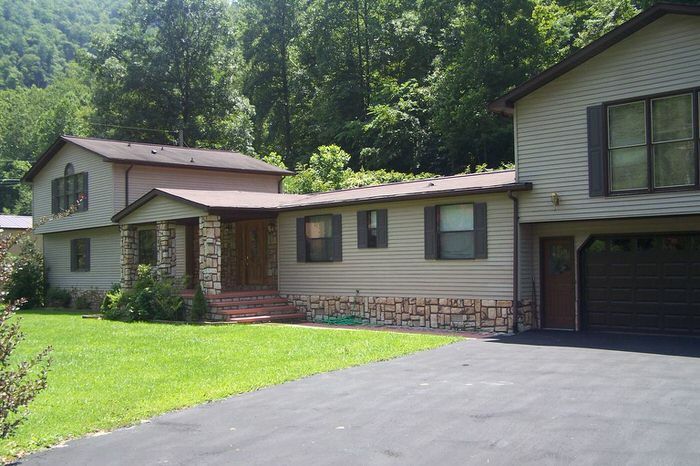 This is widely accepted by the industry as an approved method for leveling and supporting a manufactured home. In a high wind event, vibration and movement of the home can cause the wedges to become loose. IBHS recommends that you consider replacing the wedges with a concrete cap. Perimeter blocking is usually composed of structural wood members underneath the exterior of the home that is used for additional support at large wall openings, such as sliding glass doors and window openings greater than 4ʼ. If perimeter blocking is not present, window and door openings may deflect causing the windows and doors to stick in the frame. If windows or doors are sticking in the frame and you suspect that it is caused by excessive deflection around the openings, contact the manufacturer or a certified installer to review the installation and blocking. Anchors and straps are widely used to secure the home to the ground. A variety of systems are used to anchor manufactured homes. The following checklist is intended to help you perform an initial assessment of your anchorage system. You may find three or more types of anchors. Sidewall anchors are located along the two long sides of the home, end wall anchors are located along the short sides of the home, and centerline anchors are located underneath the marriage walls of double- and triple-wide manufactured homes. Some new installations include braces that anchor the piers to the home. Each manufacturer develops an installation guide that describes acceptable anchorage systems for a particular home based on expected wind risks. Start by checking the latest guides from your manufacturer or the state regulatory body. Try to determine how well your anchoring system matches the latest recommendations for high wind installations for your type of home. Some of the choices for mobile home anchors. What type of anchor attachment is used? Metal strapping is the preferred method of anchor attachment for manufactured homes. Typically, the strapping should be galvanized steel 1-1/4 inches wide and 0.035 inches thick. In general, how many straps are attached to the anchor? In high wind areas, two straps are typically used to properly attach the anchor to the frame. One strap should extend vertically from the anchor to the exterior sidewall, and the other strap should wrap around the steel frame I-beam and connect to the anchor attachment point at an angle of approximately 45-degrees. The number of anchor straps required on each side and the actual angles are dependent on many factors including the length of the home, the type of soil at the site, the expected capacity of the anchor in that soil, and the design wind speed at the site where the home is installed. In high wind areas, older installations typically had straps at 8 to 10-foot spacing along the length of the home while many of the newer installations in the same areas have straps at 4 to 5-foot spacing. If the anchor straps for your home are installed with excessive space between consecutive straps (greater than 5’) or if you have questions about the installation, contact a certified installer, to determine whether the straps will provide enough resistance during a high wind event. How are the diagonal straps attached to the frame? 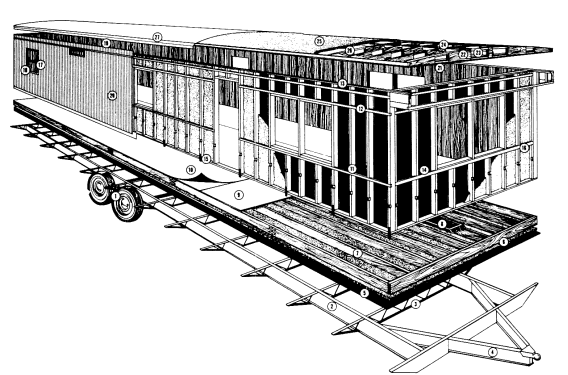 The anchor straps should fully wrap around the frame (I-beam) of the manufactured home. If straps are not wrapped completely around the frame members, the strap could disengage during a high wind event and the home could be moved from its foundations. In general, what is the angle of the strap? In most cases, the angle of the diagonal anchor strap should be approximately 45-degrees to provide the best anchorage to resist horizontal and vertical forces. If anchor straps are not at this angle and your home is not installed on a sloping site, the anchors might not be in the correct location. If you have questions about the installation, have a certified installer evaluate your installation and if necessary relocated the anchors. In general, are stabilizer plates used with the anchors? Stabilizer plates are attached to the anchors or driven next to the anchor on the side facing the interior of the home and are used to improve the resistance of the anchor heads to lateral movement. At least one manufacturer builds anchors with plates attached to a sleeve that fits around the anchor stem. They can be effective during a high wind event in reducing the amount of lateral movement of the anchoring system and consequently the home. Stabilizer plates may be located underground and it is, therefore, necessary to closely inspect the anchors for stabilizer plates. In general, what is the positioning of the anchor heads relative to the ground surface? Anchors should be installed flush with the ground to provide the best resistance to lateral forces during high wind events. Those anchors that are not flush with the ground should be re-installed so that the head is flush with the ground surface. Anchors that are bent, should be replaced with new anchors. If a strong tug on each of the anchors or straps pulls any of the anchors out of the ground or moves the head a noticeable amount, then they will probably pull out or move too much during a severe windstorm as well. A longer anchor with a large stabilizer plate may have to be installed and/or the anchor moved to a different location. A certified or licensed installer should be retained to evaluate and repair the anchorage system. Are any of the straps loose or noticeably sagging? Loose or noticeably sagging anchor straps are not providing enough tension to properly anchor the home during a high wind event. If the strap can be shaken with little effort, it is too loose and it is recommended that straps be tightened to meet the manufacturer’s recommendations. In colder regions, it is necessary to check straps more often due to freezing and thawing which can loosen straps. Are any of the bolts in the anchors loose, corroded, or otherwise severely rusted? Anchor bolts are used to secure the anchor straps to the anchor. Anchor bolts will most likely show some signs of rust; however severely rusted or corroded anchor bolts can reduce the strength of the anchor attachment and should be replaced with new anchor bolts. Additionally, any loose bolts should be tightened. Are any of the anchor straps spliced? It is recommended that spliced anchor straps not be used as they may have reduced resistance to forces experienced during a high wind event. If yes, how many crimp seals are used to splice the straps? Crimp seals are used to connect the two ends of a splice together. There are two types of crimp seals, a single crimp seal and a double crimp seal. If a splice is encountered, two crimp seals are recommended to provide the most anchor strap strength. If you identify anchorage issues as a result of this inspection and want to ensure that you maximize the anchorage resistance for high winds, have a certified or licensed installer review your installation and compare it with the latest high wind recommendations. Further, if you have the resources, IBHS recommends that you consider installing your home on a permanent reinforced concrete or reinforced masonry foundation. 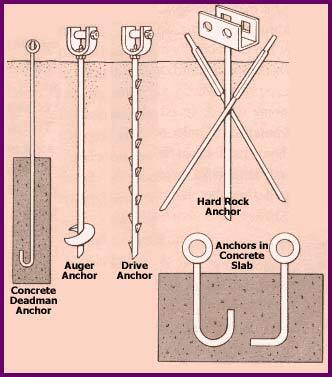 If that is not possible, add anchors to bring the installation up to the latest high wind anchorage recommendations and consider pouring a concrete slab under the home that encompasses the heads of the anchors or at least a concrete perimeter footer that encompasses the heads of the anchors. The footer or pad should encompass the tops of the anchors as this will help reduce movement of the anchor head and provide a much more stable anchorage. In addition, the footer or pad can provide a much more substantial support for the bottom of skirting around the base of the home. Never try to ride out a hurricane or tornado inside a manufactured home. Even manufactured homes with tie-downs overturn in these storms because they have light frames and offer winds a large surface area to push against. Their exteriors are also vulnerable to high winds and wind-borne debris. From 2006 to 2011, 31 percent of the 823 people killed in tornadoes in the U.S. died while in or fleeing from mobile homes, according to the National Oceanic and Atmospheric Administration. The National Severe Storm Center has found that occupants of such dwellings are 10 to 20 times more likely to be killed in tornadoes than those in conventional homes. If you’re considering buying a new manufactured home, pay close attention to the year of construction. Purchase the latest model with the highest HUD Wind Zone Rating you can afford. I copied and pasted this checklist from the site http://www.disastersafety.org/ that is part of The Insurance Institute for Business and Home Safety (IBHS). I’m not at all familiar with KY laws and regulations but I Googled it and came up with these results. It looks like either C1 or B1 is fine but the PDF’s on the 2nd and 4th results can give more info. Hi Jack! This list is from The Insurance Institute for Business & Home Safety (IBHS). I’m sure they wouldn’t mind you using it – just credit them properly if you use online or in print.